I had half of a flank steak left from my foray into microwaved beef jerky, so I needed to use it up. Luckily, just 15 pages later in the The Work, there was a recipe for Kalbi Flank Steak. This is interesting because in Korean, Kalbi means “rib”, and the marinade is applied mostly to beef and pork ribs. But hey, we’re Modernists, right? Let’s see what a different technique applied to the same product can create. …I am grateful to him for having given me a big fat book five hundred pages long to read and learn. 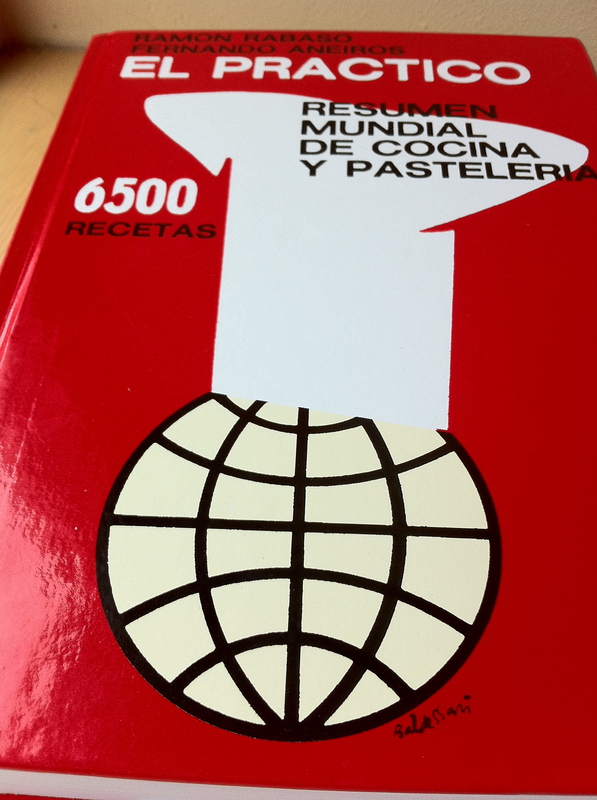 A book of classic recipes, sixty-five hundred of them, a mix of traditional Spanish cooking and dishes heavily influenced by French cuisine…I still have the book. It has a red hardback cover. It is called El Practico. The pages are frayed. The spine is cracked. But I have it in a prominent place, always at hand, in my laboratory workshop in Barcelona. Ferran Adria began his cooking career by landing a job in a hotel kitchen in order to save money to spend a summer partying in Ibiza. Ibiza is a hedonist island wonderland just off the coast of Spain. It’s a wild, endless fiesta filled with bars, babes and beaches. I know this. I spent a weekend there about ten years ago. My last night there I danced until dawn at Space, an indoor/outdoor club where airplanes from the nearby airport would launch overhead, sending the crowd into a frenzy. I barely made it out alive. Spainards are a different breed when it comes to being “a friend of the party”. I can’t imagine an entire summer there. Although I did try my best. One can understand the motivation for a soccer obsessed high school dropout like Ferran. So he took the job as a dishwasher. The cook, Miguel Moy, had a short temper and would explode at the slightest deviation from the expected way of doing things. With his demand for excellence, he gave Ferran a copy of El Practico to memorize. The first food Ferran ever cooked by himself for other people was a stew of flank steak and potatoes that he prepared one evening for the staff meal. When I read these passages, I thought I could gain an unique insight into the methods of the best chef in the world by creating his first dish. So I decided to hunt down El Practico, find the recipe for potato stew, and cook it up. And, as always, things got more complicated than they seemed. 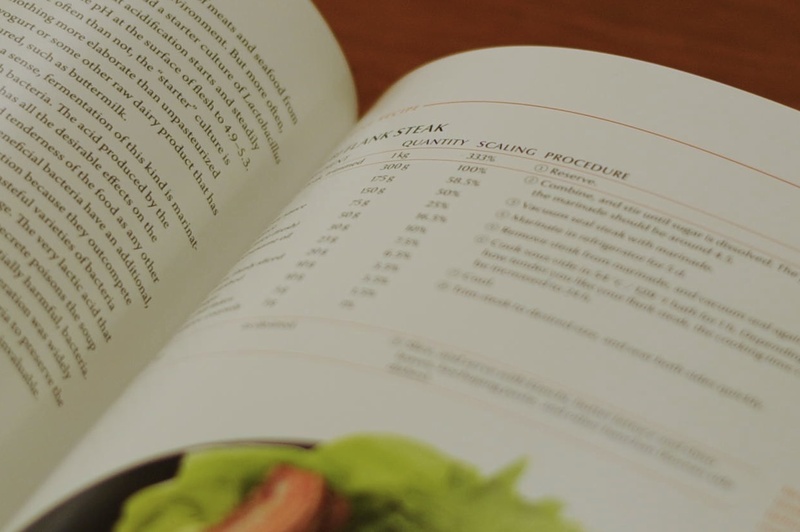 The first step was finding the cookbook itself. I had to hunt down the author’s names to make sure I was going to buy the right book. I briefly lived in Madrid (around the same time as my trip to Ibiza), so I used my connections there to find the book in a local shop. Alas, no luck. So I went online. It took a while but I finally found a copy, and after debating the price for a few days, finally let my culinary curiosity get the better of me and ordered it. They had a difficult time fulfilling the order and it didn’t land on my doorstep for about six weeks. I was very excited when it finally arrived in the mail. One thing I noticed right away was at the beginning of the book. 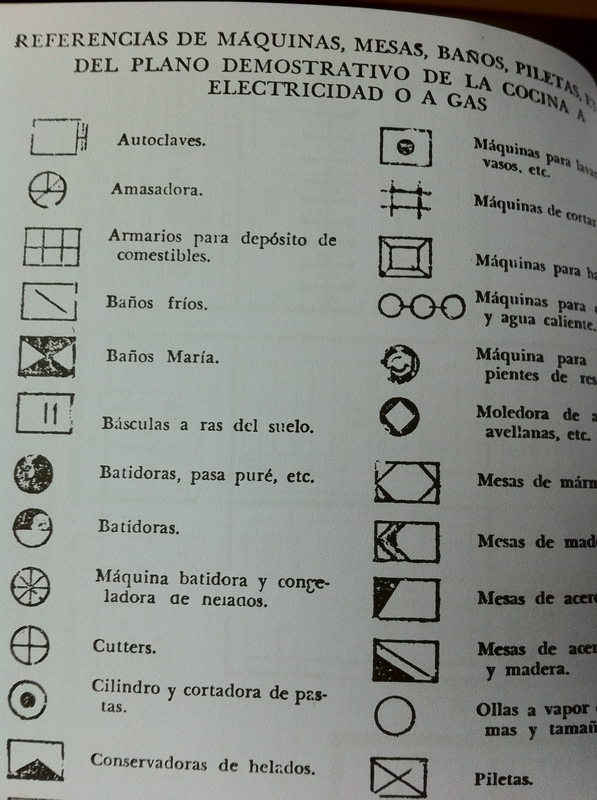 A page full of symbols, representing what I gathered were elements of a professional kitchen. 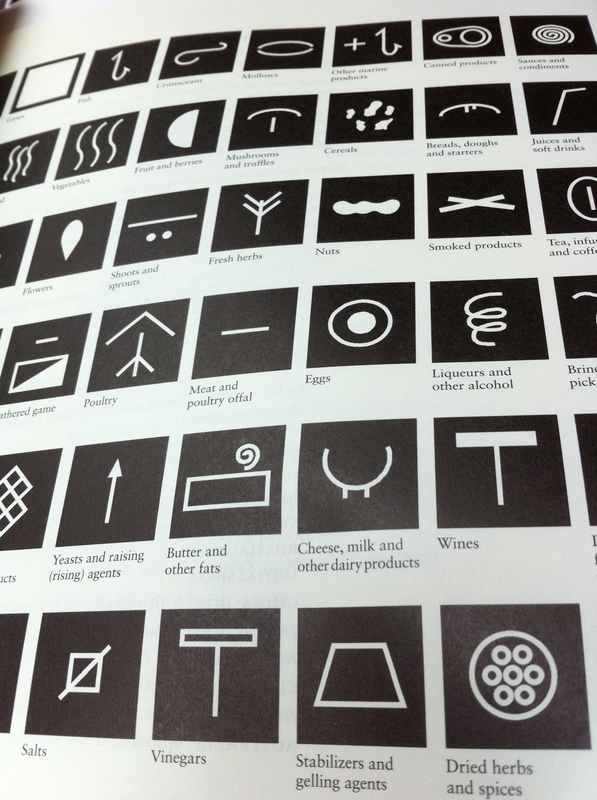 This page immediately reminded me of something I saw in A Day at elBulli: a set of symbols used to classify different product families of ingredients. Could have this system received its original inspiration from the pages of El Practico? I do not know, but the similarities are striking. So there I was, holding Ferran Adria’s prized cookbook in my hands, the cookbook that inspired him to become a better cook, to become the best cook. I flipped through the pages. A cornucopia of culinary knowledge. If only I could read Spanish fluently. I knew ‘potato’ was patatas in Spanish, so I looked it up in the book’s index, and flipped to page 449, where they had five and a half pages of short recipes for potato dishes. 117 dishes, to be exact. Which was the stew? I found that caldo means ‘broth’, so I read and re-read all 117 dishes looking for the word caldo. I found three: Lard, Paysanne, and Savoyarde. The only one that had meat in it was Lard, which had bacon. OK, bacon – kind of like jamón serrano, I thought. It’s not flank steak, but it’s close. Perhaps this was his first dish. But it seemed less like soup and more like a potato side dish. Maybe I was looking in the wrong section. So I turned to Sopas, or ‘Soups’. Once again, as far as I could tell, no luck. Next I turned to my Spanish speaking friends and asked what they would call Potato Stew with Flank Steak. Perhaps it was cocido, consome, or caldo. Maybe for meat they used churrasco, bistec, or filete. Look for estofado or guiso. It could be in French: ragoût de pommes de terre or pot au feu. And so I kept ‘reading’, searching for a recipe that would have all the elements I was looking for: potatoes, stew, and flank steak. 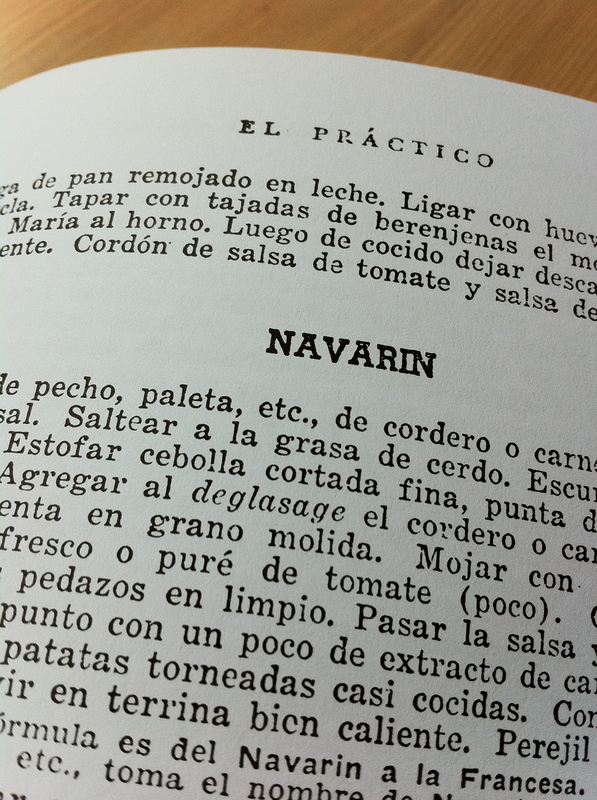 Ferran was right – a lot of the dishes in El Practico are French (and published in Buenos Aires by the way, so not really a Spanish cookbook at all). I came up with an idea: I could use my copy of Larousse Gastronomique to read the French recipes to see if they were what I was looking for. 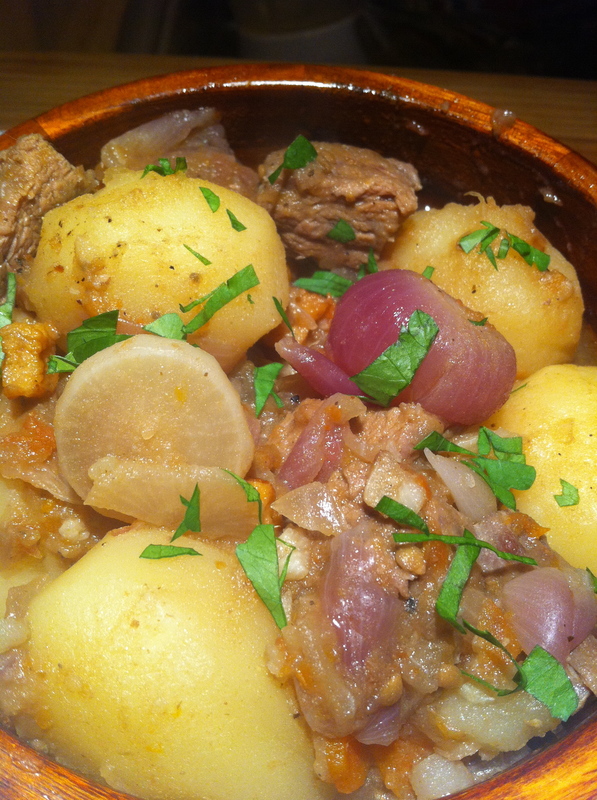 Finally, on page 323, I found a meat dish that could be served as a stew, which contained potatoes: Navarin. 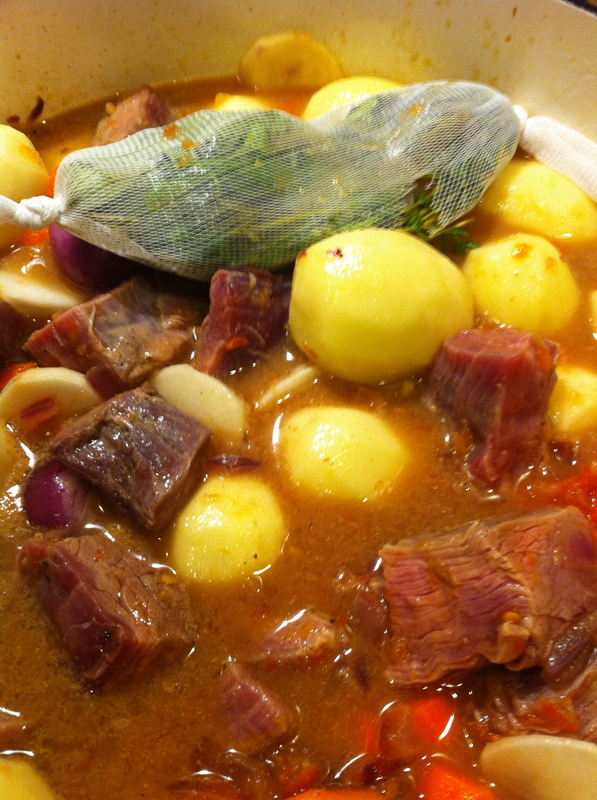 Navarin is a French ragoût (or stew) of lamb or mutton. I figured he could have substituted flank steak for lamb. It didn’t have to perfect – it was for a staff meal after all, right? It must be it. El Practico was first published in 1928, so the recipes reflect that: no measurements or steps, just short conversational sentences on how to put it all together. A good set up for a dishwasher making his first stew, as it allows a lot of leeway. I translated the recipe with the help of Google and my meager Spanish cooking vocabulary. Pedazos de pecho, paleta, etc. de cordero o carnero. Sazonar con pimienta y sal. Saltear a la grasa de cerdo. Escurrir. Deglacer al vino blanco. Brisket pieces, chuck, etc. lamb or mutton. Season with pepper and salt. 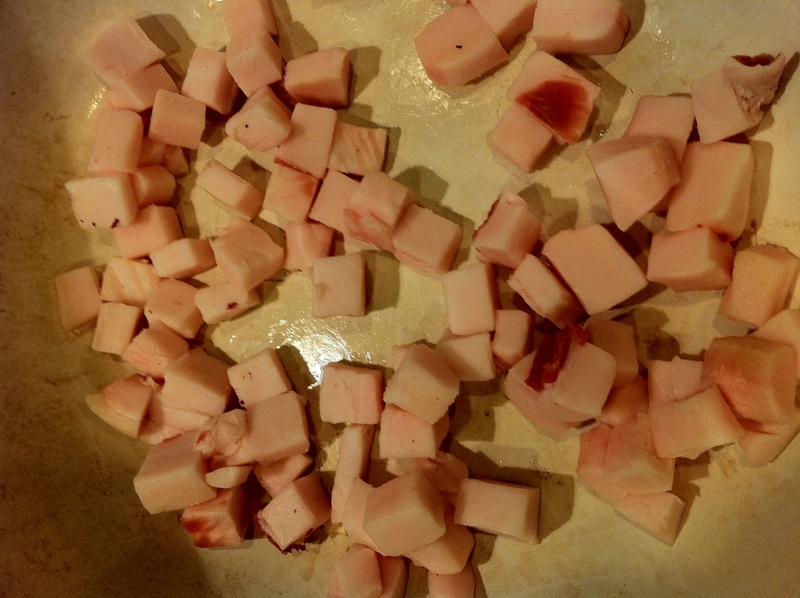 Saute the pork fat. Drain. Deglaze with white wine. Pork fat. For most people, that would entail some research to find and purchase. I, however, live right next to an Asian grocery store. I knew, having never bought it before, that they would have it. Sure enough, they did. So I began cooking it up. Next came sauteed onions, the flank steak, potatoes and a bouquet garni (what else could give it away as a French dish?). I also added pearl onions, turnips and carrots. No need to follow it to the letter. I mean, I’m just cooking a staff meal. After it cooked for a while, I removed all the meat and vegetables to another dish, reduced the stock, and added it back to let it simmer a while longer. And soon I had a potato stew with flank steak. Ferran Adria’s first dish. What I learned was his cooking, like most all Western chefs, is informed by French techniques. Having spherified coffee, root beer and melon juice earlier this year, it was enlightening to return to Ferran Adria’s roots, and see, like all artists, that he began with the basics, and it is from that foundation that he has launched his culinary innovations. And that foundation, I might add, is pretty tasty.